There may be more talk about the automakers skipping the Paris Auto Show this week than the new vehicles debuting at Europe’s first auto show of the season. Ford, Mazda, Volvo, Lamborghini, Rolls-Royce and more will skip the show, a move that would have been unprecedented in the past. In a development sure to cause chills in Detroit, Los Angeles, Frankfurt and other cities where the top global auto shows draw millions of visitors, those car companies decided they could get more attention by introducing their new vehicles outside the century-old setting of a top auto show. Alternatives range from private events to impress customers to focusing on mega-shows that attract the most press coverage. Despite that, the Paris auto show will have plenty for car fans. Here are some of the expected highlights. •Mercedes-Benz. There are even reports Mercedes-Benz could unveil a pickup, but it’s big star will likely be the new E-Class sedan. •General Motors. GM’s Opel brand will unveil the Ampera-e electric car, which is essentially the new Chevrolet Bolt electric vehicle with naturalized German citizenship. The Ampera-e already got attention in Europe when Opel announced it would cover 249.5 miles on a single battery charge at a lower price than competitors like Tesla. The Apera-e’s range is slightly longer than the Bolt claims because Europe and the U.S. use different standards to test EV range. •Volkswagen. Seeking to recover from its diesel-emissions scandal, VW begins its own electric vehicle assault with a still-secret compact model expected to go into production in 2018 or ’19. Like the Ampera-e/Bolt, it will use a new architecture developed specifically for electric vehicles. VW is aiming for a range of 250 to 380 miles. •Porsche. The VW luxury performance brand will unveil its Panamera plug-in hybrid. The big luxury hatchback will have a range of 31 miles and top battery-powered speed of 86 miles per hour. When driven by its gasoline engine, the Panamera hybrid will hit 60 mph in 4.4 seconds and have a top speed of 172 mph. •Citroen. The French automaker hopes to cash in on some of the plug-in hybrid excitement with its Cxperience concept car. It’s a low-slung sedan with rear-opening “suicide” doors and a very short rear deck. •Ferrari. 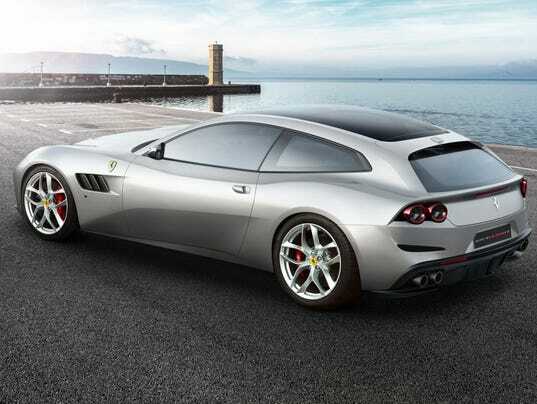 From the modestly sized department of exciting four-door luxury hatchbacks, Ferrari unveils the GTC4Lusso, the brand’s first four-seat car powered by a V-8 turbocharged engine.. The 3.9-liter engine produces 602 horsepower. The rear-wheel drive GTC4Lusso has a 46/54 front to rear weight distribution. •Lexus. Toyota’s luxury division continues to explore new SUV ideas with its UX concept vehicle, a subcompact that could use the same architecture as the upcoming Toyota C-HR. Lexus’ European design center styled the four-door UX, which has cameras instead of side mirrors. •Land Rover. The new Discovery aims to combine space and fuel economy, thanks to the brand’s new 2-liter diesel. The seven-passenger SUV shares its aluminum-intensive architecture with the Range Rover and Range Rover Sport. The vehicle will drop the LR4 name in favor of Discovery in the U.S.